In order to get your injured shoulder fully healed as fast and effectively as possible, you need to treat the injury. Painkillers and anti-inflammatories DO NOT help you heal and can even make the healing process longer, and having surgery will mean long-term consequences and prevent full recovery. Instead, you need to alleviate the swelling and discomfort, then promote bloodflow to the area to heal the injury. It's recommended you use ColdCure® and BFST® (Blood Flow Stimulation Therapy) wraps. Both are high quality medical devices that set the industry standard for injury treatment. Using advanced technology, Blood Flow Stimulation Therapy (BFST®) medical devices promote increased circulation, accelerating the healing process to the next level. Blood flow is crucial to fast tissue repair! Use BFST® to heal the tissue after your swelling. ColdCure® cold packs relieve pain and reduce inflammation after your injury. These wraps can hold the cold longer than other cold wraps using RigiGel® technology which also distributes cold evenly over the injured area. Cold is much safer than ice, which is too cold and can burn skin. ColdCure® and BFST® Shoulder Wraps are FDA registered, and are certified safe medical treatments for shoulder injuries. You can rest easy knowing you are using only professional treatment to heal your injury. Recovery can be easy if you use the right treatment. Simply follow these steps to get you and your injury on the road to fast recovery. To reduce the inflammation or pain following a shoulder injury, use a ColdCure® Shoulder Wrap for the best post-injury treatment. Before you can start healing, you need to make sure the swelling is gone. 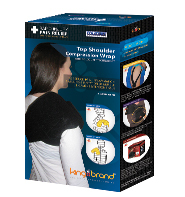 ColdCure® wraps, unlike other gels, hold their shape and spread the cold out evenly over the damaged shoulder. Cold is better than using ice, which burns the skin and is uncomfortable to wear. ColdCure® wraps are stored in the fridge and keep that cold in longer than other wraps, so you can wear it without switching out gels as often. In order to heal quickly, you need to take action to accelerate the healing process. One of the best ways to do this is to improve your circulation. Better blood flow means that your body can deliver oxygen- and nutrient-rich blood to the injured shoulder, for the fastest treatment. A Blood Flow Stimulation Therapy (BFST®) Shoulder Wrap offers the best solution, as it penetrates deep under the skin to the damaged tissue. REMEMBER: If you are still experiencing swelling, you need to reduce the inflammation before using BFST® to heal the tissue. Using heat or BFST® before the swelling in your shoulder has gone down will only make your injury worse. Do not combine cold and hot treatments at the same time. Both wraps uphold a high standard of comfort. Each is made of soft, high quality Neoprene and crafted specifically for shoulder injuries. These devices are shaped with your injury in mind. The ColdCure® gel itself is no ordinary design. It is made to surround the entire injured area, enveloping it with the pain relieving power of RigiGel®. The BFST's® patented Energy Web® is also designed to provide coverage across the whole injury, and improves circulation throughout the area. For more a more in-depth explanation of the functions of these wraps, we recommend browsing the ColdCure® and BFST® website. Click here for more about these products! Just started using the shoulder wrap, is is supposed to have an intermittent buzzing sound? Yes, the buzzing is normal in some of our energy webs. Most common in the shoulder as it is a larger energy web as well as it is close to the ear so can be detected easier compared to our other wraps. Copyright 2011-2019 King Brand Healthcare Products® Limited. All Rights Reserved. Rigigel Gel Pack, Rigigel Gel Pack, Bakers Cyst, Plantar Fasciitis, Infraspinatus Injuries, Cortisone Information, Cortisone Treatment, Supraspinatus Tear Treatment, Executive Office Space for Private Businesses, Descartes Engineering and Web Development, King Brand Healthcare Products, Professional Back Treatment, Perpachill Coldcure Technology, Foot Tendonitis, This Is My Complaint. 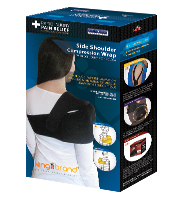 King Brand® ColdCure® Cold Therapy ice packs and gels are the best solution to your shoulder injury. 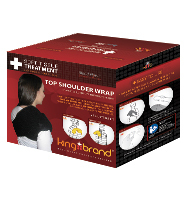 King Brand® ColdCure® RigiGel® Shoulder Wraps hold the cold longer, stay in place and are safer than any other product. 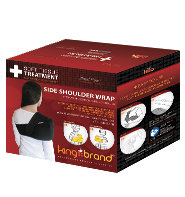 Treat your Shoulder pain with King Brand® for the best results.